Philanthropist • The Utah retail genius gave millions to causes he supported and loved. Tribune file photo Well-known Utah businessman and benefactor L.S. 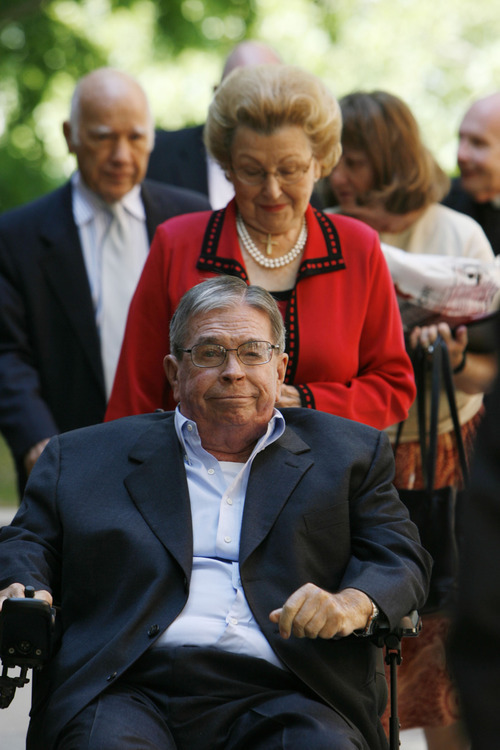 "Sam" Skaggs died at his home in Salt Lake City early Tribune file photo Utah businessman and benefactor L.S. "Sam" Skaggs died at his home in Salt Lake City early Thursday. PHOTO | Courtesy of University of Utah Sam Skaggs works in a school lab in the 1940s. He dropped out of Westminster College to PHOTO | Courtesy of University of Utah Sam Skaggs. Tribune file photo Well-known Utah businessman and benefactor L.S. "Sam" Skaggs died at his home in Salt Lake City early Thursday. He was 89. In this 2009 photo, he speaks with University of Utah President Michael Young during a groundbreaking for the U. College of Pharmacy, a $69 million research facility that will be named the L.S. Skaggs Pharmacy Institute. Tribune file photo Utah businessman and benefactor L.S. "Sam" Skaggs died at his home in Salt Lake City early Thursday. He was 89. 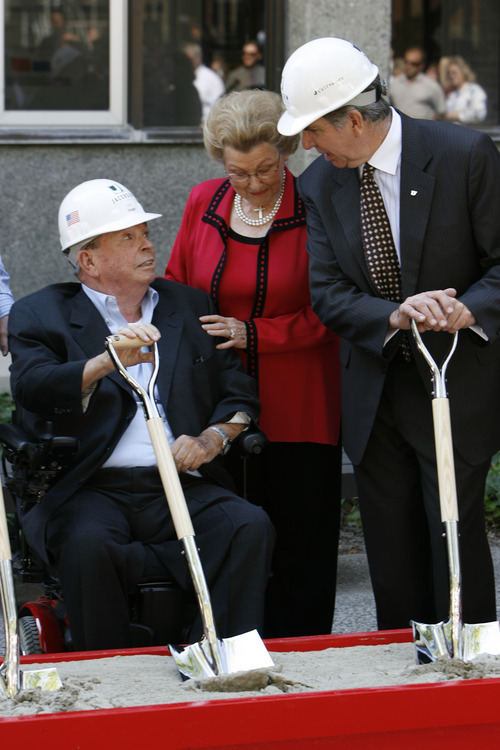 In this 2009 photo, Skaggs is accompanied by his wife Aline for the ground-breaking of the University of Utah College of Pharmacy, a $69 million research facility that will be named the L.S. Skaggs Pharmacy Institute. 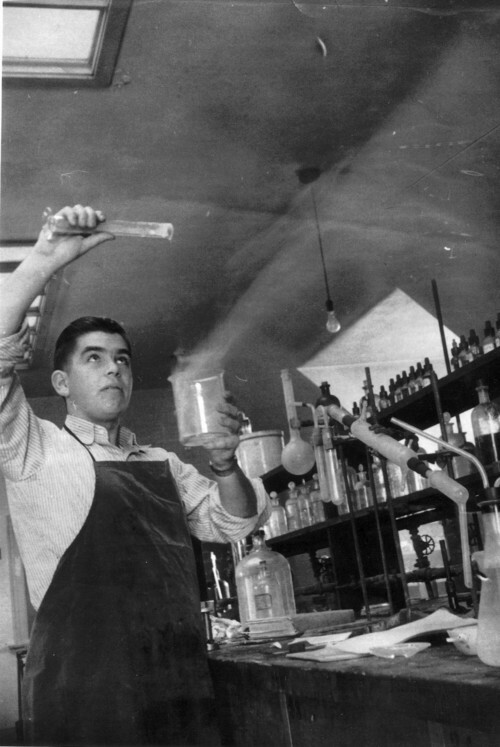 PHOTO | Courtesy of University of Utah Sam Skaggs works in a school lab in the 1940s. He dropped out of Westminster College to serve in Europe during World War II. PHOTO | Courtesy of University of Utah Sam Skaggs. Well-known Utah businessman and benefactor L.S. "Sam" Skaggs, who shunned the spotlight while quietly helping pioneer the development of the retail superstore, died at his home in Salt Lake City Thursday. He succumbed from causes incident to age, said Ronny Cutshall, president of The ALSAM Foundation, the Skagg&apos;s family charitable institution. Skaggs was 89. He built a retail food-and-drug empire from his Salt Lake City headquarters that operated under the American Stores name. And during his long career he quietly funneled untold millions of dollars to charitable causes, including the Skaggs Catholic Center, a 57-acre complex that houses Juan Diego Catholic High School, St. John the Baptist Elementary and Middle School, and the Guardian Angel Daycare. "He was a lifelong Baptist, and was converting to Catholicism (in 1995) when the need arose in our diocese to build a school," said Galey Colosimo, principal of Juan Diego, who announced to the student body during morning prayer that Skaggs had died. "It is a sad day, but we remember (him) with gratitude for all he has done for us." Skaggs, who rarely gave media interviews during his years in business, was the grandson of a Baptist preacher and grew up in Yakima, Wash., and in Idaho, working in his father&apos;s drugstores. His father, Leonard S. Skaggs  one of six sons of Safeway founder Marion Skaggs  had purchased PayLess Drug Stores in Salt Lake City in 1939, using his Safeway stock proceeds. Sam Skaggs took over the PayLess chain at age 26, after his father&apos;s death from stroke in 1950. In 1965, when the business had 69 locations, it incorporated as Skaggs Drug Centers and went public. In 1979, Skaggs took over American Stores in Philadelphia. Several strategic acquisitions turned the Utah-based company into the second-largest U.S. food retailer  behind Kroger  and one of the biggest drugstore chains in the country. There were 11 stores when Sam Skaggs took over the company. Before his retirement in 1995, he was head of one of the world&apos;s largest food companies with 1,700 stores in 26 states and annual revenue of $22.2 billion. Skaggs was one of the pioneers of what would become the superstore, said David Davis, president of the Utah Food Industry Association. "I&apos;m not sure anyone who has participated in the grocery industry over the past half century didn&apos;t know Sam Skaggs or had been touched in some way by his efforts," said Davis. "He was among the first to bring together hard goods, or non-foods (and pharmacies), into the food world. He also was a giant in the community, an incredible philanthropist who gave back to communities across the country." Skaggs dropped out of Westminster College to serve in Europe during World War II. He witnessed the compassion and generosity of Roman Catholic chaplains during the war, resulting ultimately in his conversion that faith. Attorney and former U.S. Bureau of Land Management Director Pat Shea described Skaggs as a brilliant businessman who had a sixth sense of the marketplace. "After his conversion, he went about fulfilling his sense of social justice, building churches, schools and research centers that would benefit current and future generations," Shea said, noting that Skaggs also had a commitment to good politics and civic affairs. For many years he was the sustaining force behind the Democratic Party in Utah. Skaggs&apos; generosity, along with that of his family, has rivaled the philanthropy of other famous Utah families, such as the Huntsmans, Sorensons and Eccles. Other major beneficiaries include the Scripps Research Institute in La Jolla, Calif., and the University of Utah. 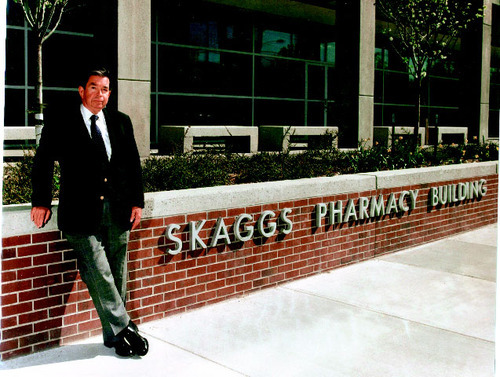 For years, Skaggs had quietly funneled tens of millions of dollars to pharmaceutical research and education, which helped build the U.&apos;s pharmacy programs, among other endeavors. That legacy reached a critical milestone in 2009 when the U. broke ground on a 150,000-square-foot pharmacy research center named after Skaggs. The family, through its foundation and Skaggs&apos; personal fortune, gave $30 million toward the $69 million project. At the time, daughter Claudia Skaggs Luttrell said that growing up, her father&apos;s job at the drugstore "was to sweep floors and make ice cream, but he would migrate back and watch the pharmacists compound medicines." Sam Skaggs also watched the construction of the pharmacy building, and was planning on attending the ribbon cutting on April 12, said Vivian Lee, U. senior vice president for Health Sciences. "He will be in our hearts and minds on that day," said Lee of the ceremonies. "The excellence of our programs and faculty are due, in part, to his generosity and to the generosity of the Skaggs family." For the past 32 years, the College of Pharmacy has been ranked among the top four pharmacy colleges in the nation. It is ranked second by the National Institutes of Health for peer-reviewed research. The new building is just south of the College of Pharmacy&apos;s current home, built with Skaggs&apos; money in 1965, and which he asked to be named after his father. "Through Mr. Skaggs&apos; contributions, the College of Pharmacy has been able to excel in pharmacy research and education," U. pharmacy dean Chris Ireland said in a statement. "Our college is forever indebted to the Skaggs family and hope we can carry forward the legacy of Sam Skaggs."